Photographing jewellery and other beadwork is something that I’ve had a lot of practise doing. So you might think me very well-qualified to be writing this article. In some respects, yes I am: everything I’ve learned has been through trial, error and a lot of mistakes! In another respect, you might prefer to be reading something written by a professional photographer, so if that is the case, then stop right here! As soon as I set up my own website I had to make an attempt at photographing jewellery and other beadwork. It just so happens that my brother is a semi-professional photographer (by which I mean he has a day job completely unrelated to photography, but would rather be out taking photos all the time and has invested in a full set of professional photographic equipment). You might think this would be a perfect pairing, but he actually likes to spend his time photographing nature (you can see his very beautiful work here on his website) and he would be the first to confess that he is not passionate about photographing jewellery, beads or indeed anything else in a studio setting. He does happen to be a lovely person, though, and was kind enough to take the early photos for my website, my very first book, and also to share some helpful tips with me. However, as I started writing more books, adding ever more products to the website, entering more competitions and generally needing to take more photographs, I decided it was time to start doing this for myself. 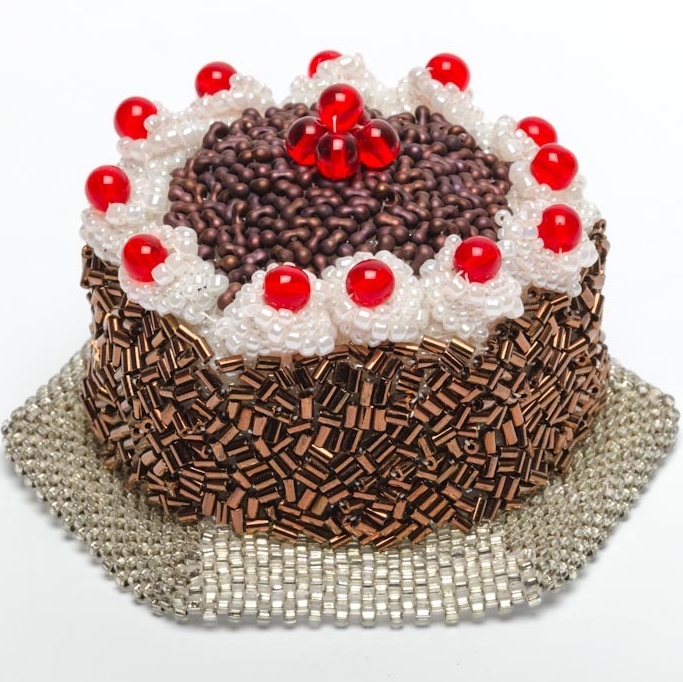 I have also gained some experience from working with the professional photographers Michael Wicks and Jonathon Bosley who took the photos for my Sweet Treats book and the ebooks I have published through Vivebooks. Spending time observing them work gave me an enormous insight into how lighting is used in a professional studio and the importance of composing a shot. 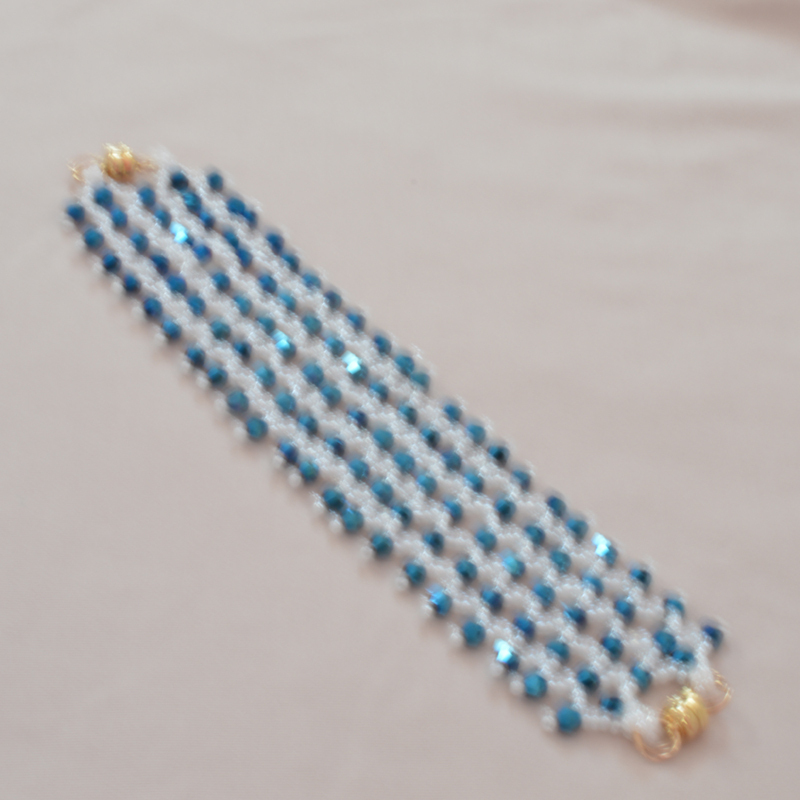 You can judge for yourself from the photos on this website, in the magazines to accompany it and on my Beadflowers website whether or not I’ve learned my lessons well, but here I am going to share with you a lot of observations. 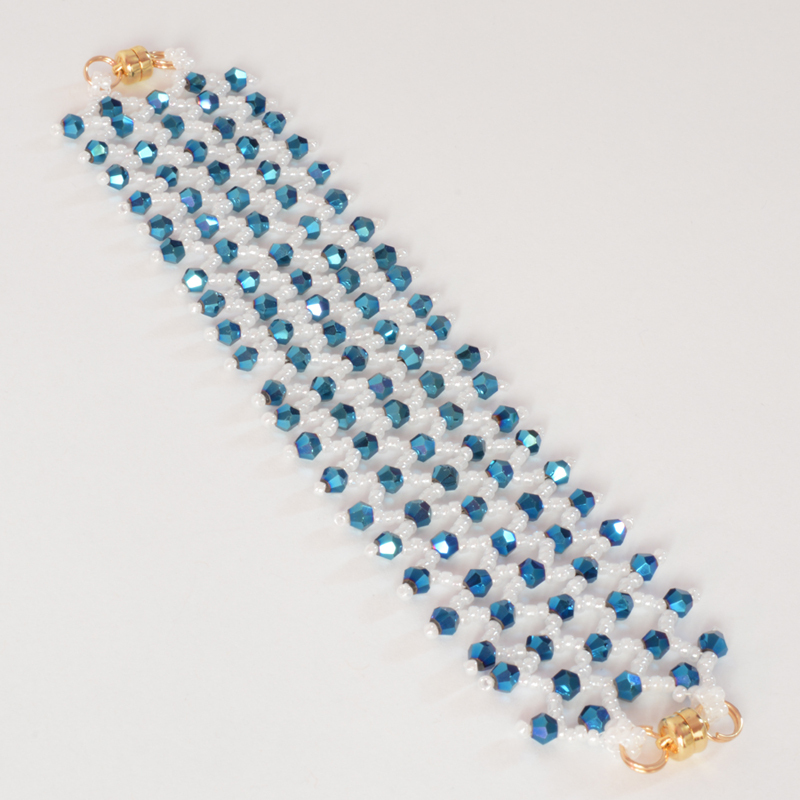 It may sound obvious, but when you are photographing jewellery or any other beads, findings or beadwork, you really need the subject to be in focus. The trouble with jewellery and beadwork is that the intricacy of the work can make it tricky to really get a sharp focus. In case you are wondering what I mean by ‘in focus’, the jewellery should look sharp and not at all blurred. You will probably notice if your jewellery is seriously out of focus, as in this shot where the blurring could almost count as an artistic effect! The difficulty is in seeing the pinpoint focus on a small object, so if you want to check, then zoom in on the photo as far as you can (either on your camera or on the computer after you have downloaded the photo) and if the details still look clear, you are fine. Typically your work will be fairly small, so you will feel you want to get the camera lens as close as possible when you are photographing your jewellery so that the piece fills the photo. This may not be the best option. Most modern cameras use autofocus, so you are at the mercy of the camera deciding what it’s supposed to be focusing on. Also, a lot of autofocus settings will only work at a certain distance away, usually around a minimum of about a foot, maybe more. Imagine trying to photograph a ring from a foot away – it is most likely going to look like a tiny dot in the middle of the photo and any intricate detailing will be lost. So bear this in mind. If you are lucky enough to have an SLR camera that will use different lenses, then it would be worth buying a macro lens. 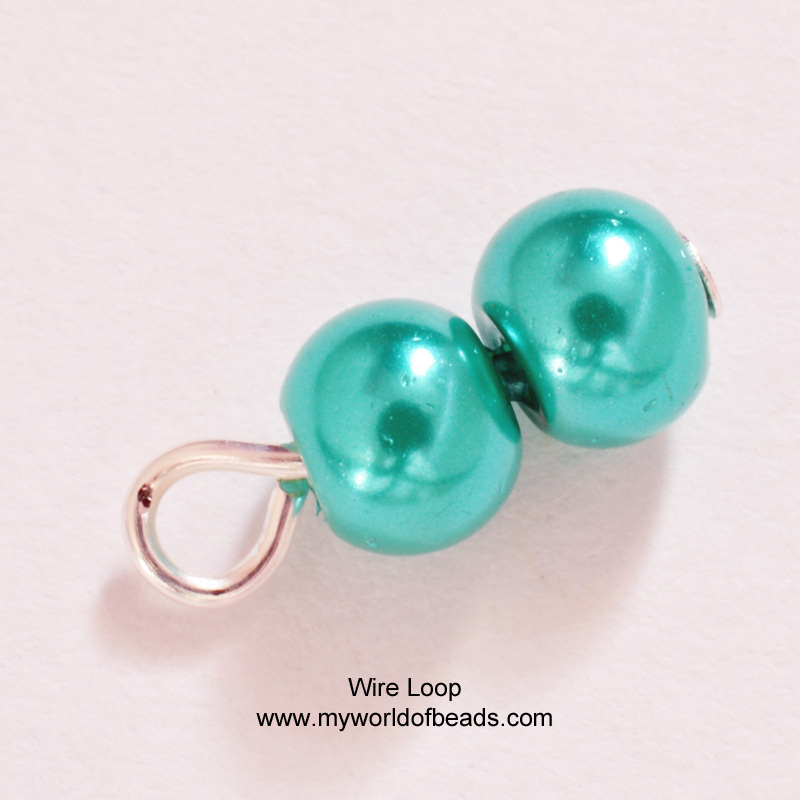 This is specially designed to photograph objects at very close range, so you can get literally millimetres away from your jewellery if you want to really show the detail, as in this photo of two 4mm pearls on a wire loop. If you do not have a camera that will allow you to use different lenses, then check the camera settings. If you have the option of choosing a ‘macro’ setting, this should allow you to position the camera a lot closer to your beads and still get a photo in focus. Secondly, think about what can cause blurring in a photo (other than dodgy autofocus!). This occurs when either the camera or the object it is photographing moves whilst the photo is being taken. You might think this won’t be a big problem when the subject is a piece of jewellery – it’s a static object, so won’t move of its own accord. This is true if you are photographing jewellery lying on a flat surface, but if you want to photograph a pair of earrings hanging as they would when being worn, it can be a different matter. I have tried this: when you hang the earrings on an object, this usually causes them to sway around. It can take quite a few minutes for the swaying to really stop properly, so my advice is to hang your earrings, then walk away and leave them for five minutes before you try to take the photo. Just be careful you don’t accidentally jog them again when you return! If they haven’t settled properly, then the camera will certainly pick this up with a slightly out-of-focus shot like the one above. 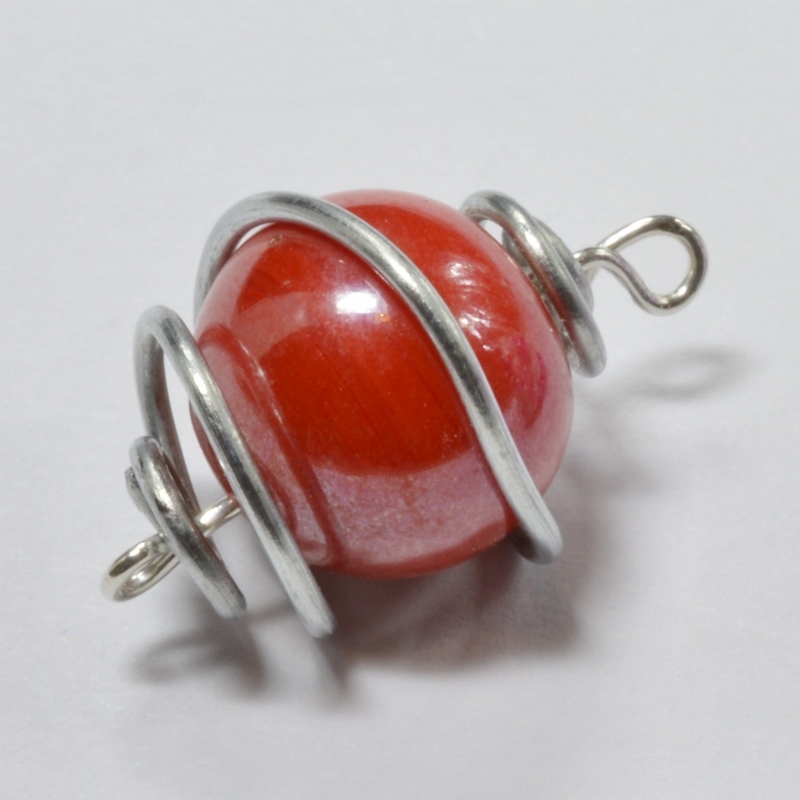 You can find the same problem with a round bead: it has a tendency to roll unexpectedly when placed on a flat surface. My tip for dealing with this is blu-tak! Take a tiny, tiny piece of blu-tak and stick it onto your surface, then place the bead on top of it. Take great care that you can’t see any of the blu-tak in the photo and also make sure you remove any remnants from the bead afterwards, but this works every time! You can also use this if you are trying to position something at an angle where it’s not happy sitting on its own, but we’ll come onto composition later on. The other reason a photo can end up blurred is if the camera moves as the photo is being taken. Even the act of pressing the shutter can cause your camera to wobble ever so slightly – that is actually what happened in this photo to the right. It’s not badly out of focus, but if you look up close, it isn’t quite ‘sharp’. Unless your camera takes the photo in a millionth of a second, you may also find it wobbling as you hold it – that is what happened in the blurred photo above. Happily both of these problems are easy to resolve. If your camera can take it, then invest in a tripod. I have a miniature tripod that was inexpensive, but incredibly good. It’s called a Gorillapod and it sits on a table, but you can alter its legs to adjust the height or angle. You can also alter the head area that fixes onto the camera so that you can tilt the camera and switch between portrait and landscape views. There’s a link to one at the bottom of this article. Even with a tripod, you may still find that pushing the shutter causes some slight movement, so I take photos with my delayed timer setting. This means I can press the shutter button, but the photo isn’t actually taken for about ten seconds, leaving me time to get clear of the camera so I don’t risk jogging it. Lighting is the bane of every beader or jewellery maker’s life when it comes to photography. I wish I could say that I’m about to tell you how to get the perfect lighting, but I’m not! I understand the principles of what I’m trying to achieve, but putting those into practise with absolute reliability is still beyond me. In technical terms, a photograph should be well-lit, but not over-exposed. Well-lit means that the colours will look as true as possible to life. My tip for trying to achieve this is to look at the white in your photo – does it look truly white or is it a shade of grey? If it’s a very pale grey, you may be fine, but if you’re looking at something that is very grey, then you probably need to lighten the photo a little. I photograph jewellery and beadwork on a white background (unless the bea ds are white, in which case you may need a bit of colour) so it’s easy to tell whether the lighting is too dark. However, most jewellery components, whether they’re metal or beads, tend to be shiny. This is what makes it so difficult to get the exposure right. Your background may look rather grey, but you may find that if you try and lighten it, your beads then look over-exposed and seem to glare out of the photo blindingly – see what I mean in the photo to the left? My only piece of advice is to just use trial and error – keep adjusting things and taking the photo over and over until it looks right. Ok, so this isn’t scientific, but it does work if you have the time! If you use photo processing software like Photoshop, you may be able to lighten the photo, or areas of the photo when you process it, so that is something else to try. The second point about lighting is about creating an even light. If you stand your jewellery in bright sunlight, it will cast shadows on the background. The same applies if you are using an artificial light source. To counteract this problem, if you are taking photos outside, then the best light is usually on a bright, but cloudy day, so you avoid shadows. Unfortunately it isn’t possible to order the weather to suit when you need to photograph something, which is why professionals use studio lighting. 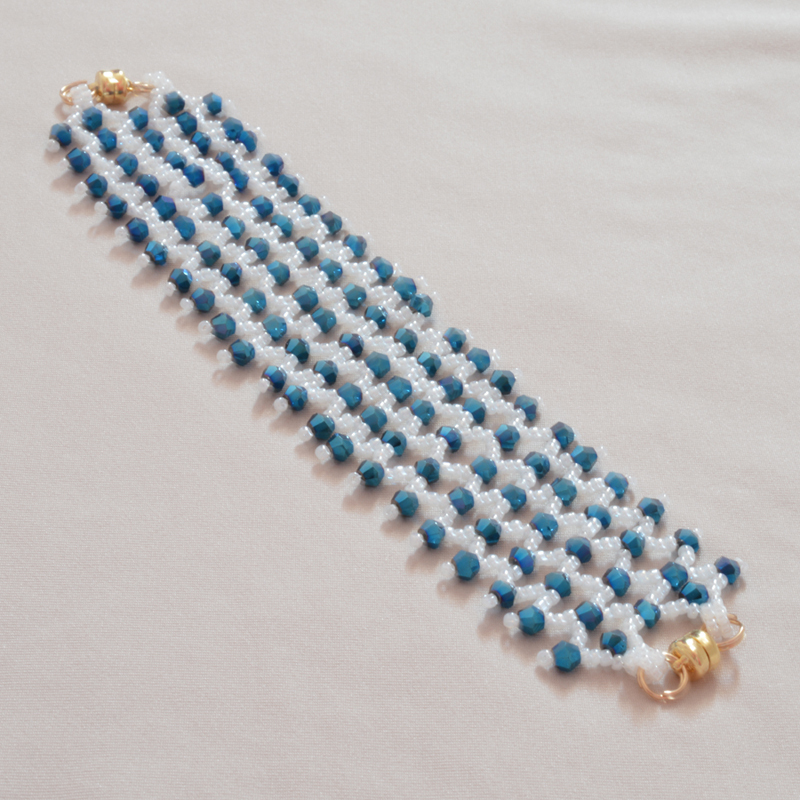 I do not have a professional photography light, so I tend to use my daylight lamp – the same one I use when I am beading. This gives me a bright, true light, but the lamp is not huge in surface area, so again, it is casting a light from a particular angle and can cause shadows. You can try balancing this out by using two or three daylight lamps placed around the object evenly so the shadow from one lamp will be counteracted by the light from another. You can also achieve a similar effect by using a ‘reflector’. This can be an expensive piece of professional equipment or you can make do…just find something, perhaps white card, perhaps a highly reflective surface like metal, that will bounce the light back. Place your reflector on the opposite side to your light and you should be able to create a more even light. It is also worth trying to position the light so it shines down onto the jewellery, not in from one side – this way, any shadows that do occur will be underneath the jewellery where they are a little less visible than if they were at the side. You may also have seen light diffusing boxes, sometimes advertised as ‘mini photographic studios’. These are fairly inexpensive and work well for reducing shadow, but I find that as my lights are not as powerful as really expensive professional lighting, the box actually reduces the amount of light, so my photos then look too dark. If you are working with artificial light, then take care. A lot of lightbulbs have a slight colour cast. This isn’t something that is particularly noticeable until you come to look at the photos of your beads. Once again, check any white areas: you may find they look slightly pinkish or yellowish and this is the sign of artificial light that isn’t giving a true colour. If you are photographing jewellery to sell, then you want your colouring to look as true as possible. Look at the two photos below. Believe it or not, they were taken just minutes apart – the same piece of jewellery, with identical backgrounds, using the same camera. The photo on the left was lit with a daylight lamp, while the photo on the right was lit with the electric light in my room – just look at the difference in the colourcast. If you are interested in the technical side, then you should know that the exposure of a photo is determined by the amount of light that is let through the aperture (the part of the camera that opens and closes when you press the shutter button). On an SLR camera, this can be altered in two ways: either by changing the size of the aperture to make it larger (let in more light) or smaller, or by changing the shutter speed. A slow shutter speed means the aperture stays open for longer, so more light is allowed into the camera. By playing with both these settings, you can lighten or darken your photos until they look correctly exposed. If your camera is not an SLR, then it may still have a version of this. Check through the settings and see if you have a setting for ‘cloudy days’. This will be the equivalent of changing either the aperture or shutter to allow more light into the camera. The only difference is that you can’t alter it, but have to rely on the camera to sense what it needs. I have written a separate, more detailed article on composition, so if you are interested in this angle, then you can read more here. For now, I want to talk briefly about what composition means. It is a combination of the way in which the jewellery is displayed and the angle from which it is photographed. You will want to use a different composition depending on the reason why you are photographing jewellery. If you are trying to sell it, you may want to show it on a model so people can see how it will look when it is being worn. If your photo is all about showing your technical skill, for example in a competition entry, then you want to ensure that nothing distracts from the jewellery itself. This is basically the difference between a ‘styled’ shot, so one that includes other objects to set a scene, and a ‘plain’ shot where there is no background. I mentioned that when I am photographing jewellery I use a white background. This gives the flexibility to help me show the colours in as true a light as possible and, if the photo is going to end up in a book or magazine, it allows the background to be removed altogether so that the jewellery can appear to leap off the page. However, if your jewellery is silver, platinum, pearl or made with white beads, the white background may cause a problem as the jewellery will tend to merge into the background. The temptation is then to photograph pale jewellery on a dark, perhaps black, background. This looks stunning and will certainly highlight the jewellery, but it can also cause problems with your camera’s exposure. The camera may be confused about whether it is trying to make the correct exposure for the jewellery or the background. On a black background, the camera is likely to think it needs to let in a lot of light and this can leave your jewellery looking over-exposed. If this is the case, then try a paler background – even just a cream or beige will be enough contrast to allow the jewellery to show up, but also help to avoid over-exposed beads. 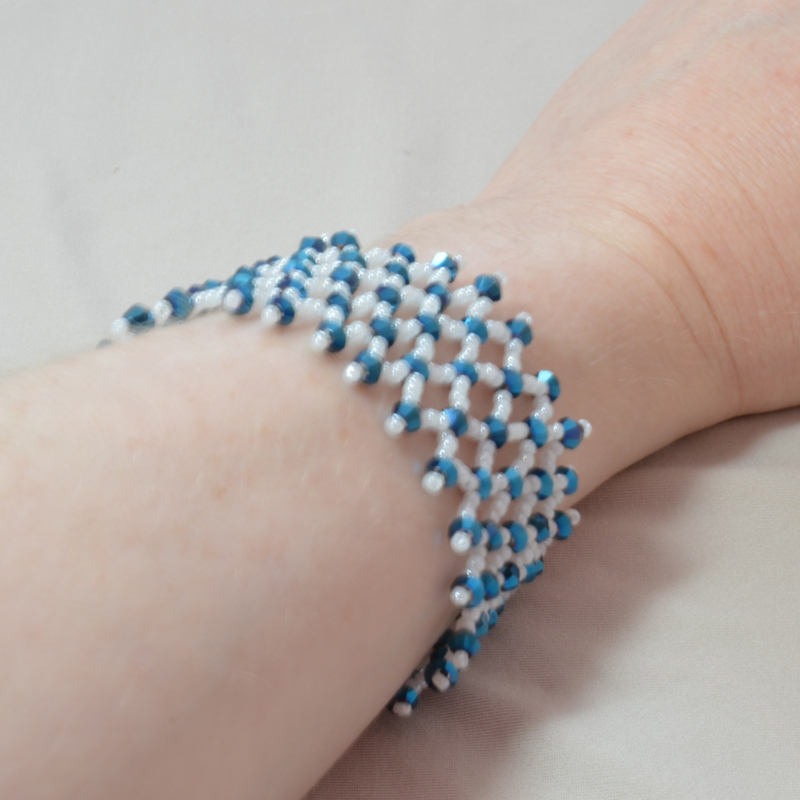 You can see in some of the photos above, the bracelet shows up better on the beige background than the white background – the white beads tend to be a little lost, so it is hard to appreciate the netting pattern. I hope you have found at least some of this advice helpful and that it will make you think in different directions when you are photographing jewellery and beads. I have found that using a simple silver cake board is an inexpensive and useful way to cast light on the shadow side of your jewellery item when photographing it. Another useful tip for those who cannot afford the more expensive editing programmes is to download Picasa. It’s free and has quite useful and adequate editing features for a simple and quick touch-up. I use it all the time. Thanks Corinne – those are really useful tips.